The ONLINE | @ Your Pace Seminar is quite simply an edited and expanded digital recording of a full 3 day seminar. Unlike the LIVE | Face to Face Seminar, this format is not limited by time constraints and thus has many segments that are recorded specifically for the ONLINE Seminar. The greatest advantage of this format is that you can stream the recordings at your pace and in the comfort of the place of your choice. Whether at work, in a café, on the road or in your pajamas, if you have a WiFi connection, the ONLINE version of the seminar offers great convenience. Best of all, you can replay, skip or return to any segment as you please. Whereas the LIVE Seminar is completed in a 3 sessions over three days, the ONLINE format allows you flexibility to complete the seminar in a period of eight weeks from the time you sign on. The content of the recordings is indexed and offers search features by topic and by chronological sequence. 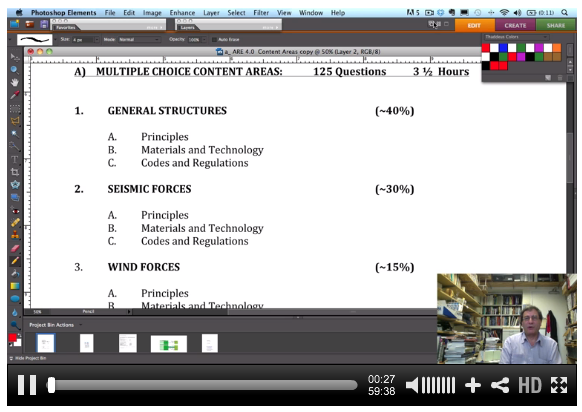 The format of the ONLINE Seminar recordings is similar to the LIVE Seminar in which Professor Thaddeus draws on a tablet computer as he works through concepts and problems explaining the necessary steps to determine the correct answer. He also uses the tablet to draw on projected photos, visually connecting structural diagrams with their real life counter-parts. His computer-animated illustrations provide a clear understanding of the behavior of a variety of structural systems under different loading scenarios. A series of laser cut “TOYS” provide yet another alternative to display the action of forces on different structural members. In short, Professor Thaddeus has numerous methods through which to assure that seminar participants understand everything they need to know to successfully study and pass the Structural Systems Division of the ARE. The ONLINE | @ Your Pace Seminar sells for $325 and gives you unlimited access to the recordings for a period of 8 weeks. It is highly recommended that you sign up for the ONLINE Seminar only when your work and personal schedule allow the quality time needed for studying the material. For most, it is difficult to make the time to study and test for any of the divisions of the ARE. If this is an important milestone in your career, then you will find the time to make it a priority and finish the licensing process expeditiously. Good luck with the ARE and best wishes for a successful and prosperous career in architecture.